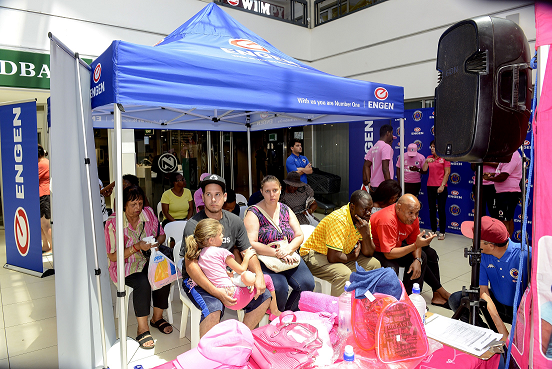 Engen and football partners SuperSport United joined PinkDrive for a breast cancer awareness campaign at the Montclair Mall in Durban on Saturday, 20 January 2018. The plight of men and women fighting breast cancer is ongoing. 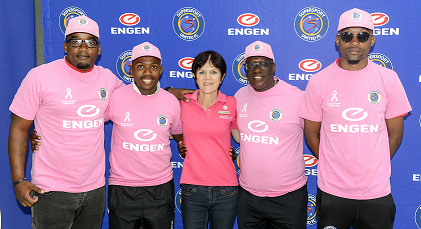 This is why Engen and SuperSport United along with Pink Drive will continue to activate free testing and information workshops for men and women throughout 2018. 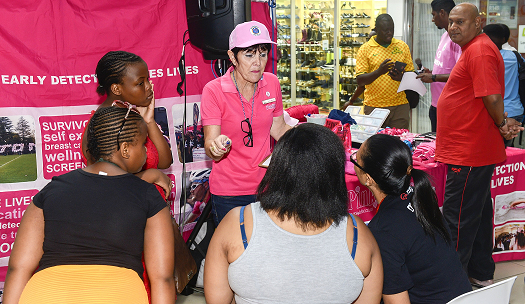 At the event held at the Montclair Mall, men and women from the surrounding community availed themselves for testing and education, showing a real interest in gaining an awareness of their status. Seventy-three people completed the test, including 7 men and 66 women with two people referred to their personal doctors. SuperSport United Ambassador, Thabo September attended to encourage men and women to be tested. Speaking afterwards, September said: “I am honoured to raise awareness for this cause and it is important that I lead from the front. “As early detection is critical to saving lives, testing takes only takes two minutes and this may be the most important two minutes of your life. “We must educate people about breast cancer awareness and I am honoured to play a small role in encouraging men and women to get tested,” added the former SuperSport United star. The SuperSport United contingent at the Montclaire Mall also included defender, Thabo Mnyamane. “It’s important for young people to get tested as early as possible, as early detection could save a life and can really make a difference in the lives of young people,” said Mnyamane. Engen representative Brad Bergh extended thanks to SuperSport United for participating in the initiative. “As Engen, we are proud of our partnership with SuperSport United and their commitment to making a difference within the communities in which we operate. A first for South Africa!